Buxtehude's visit with Arp Schnitger in Hamburg in 1687 began an association that lasted for many years and resulted in the building of the four-manual organ at the Cathedral in Lùbeck, as well as modifications to the organ at Saint Marien. Hans Davidsson explores the encounter between Buxtehude and Schnitger using the four-manual organ in Gothenburg, Sweden in this final volume of the complete works of Buxtehude. On a chilly November evening, the Hopeful Gospel Quartet — Garrison Keillor, Mollie O’Brien and Robin & Linda Williams — traded musical moments with the VocalEssence Chorus and Ensemble Singers in a concert at Orchestra Hall, Minneapolis. The evening seamlessly blended American folk traditions with choral masterpieces old and new, from “Will the Circle Be Unbroken” to “Now Thank We All Our God.” Garrison Keillor shared his Thanksgiving memories in a hilarious yet poignant monologue. Now available nationally for the first time—from The Gothic Catalog! All components make this the ultimate organ CD, with two booklets comprising 56-pages of detailed information on registrations, the organ, Weckman, and his music. Organist of the Jacobi Church in Hamburg, Matthias Weckman (sometimes spelled Weckmann) was a student of Heinrich Schütz and Jacob Praetorius II. He combined elements from a wide variety of musical languages to create a clear and complex style all his own. Hans Davidsson is the world's leading Weckman scholar and this recording is the first to use Weckman's original registrations. Our Price: $29.98 - includes Free Shipping! Robert Bates plays the restored 1630 organ of Saint-Michel Church in Bolbec, France in this first recording of the complete organ works of Jehan Titelouze. Known as "the father of French organ music", Titelouze was organist of the cathedral in Rouen and was one of the earliest to publish organ music in France. This is the first recording of his complete organ works and his been awarded the prestigious German Music Critics Award: "Robert Bates peforms brilliantly on the restored 1630 organ at Saint-Michel in the Norman Bolbec. The instrument offers ideal conditions for Titelouze’s great art of counterpoint, and Bates skillfully and imaginatively exploits all these possibilities. The magnificent organ sound is captured full of rigour, poetry and depth by perfect recording technology revealing all dimensions of the Church space." This unusual CD documents a tri-part program of 20th-century music, organized and composed by Robert Bates. It includes many world premier recordings. With interspersed spoken texts and imaginative programming, Bates explores the nature of the world and ourselves, through verbal themes and non-verbal sound paintings. Music by Bates, Ligetti, Pärt, Guillo, Alain, Hampton, Tower, Demessieux and Messaien. This is the most unusual organ recording in our collection, and it is a masterpiece of invention, symbolism and imagination. 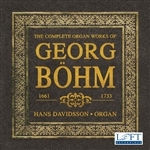 The first recording of Georg Böhm's (Boehm, Bohm) complete organ works performed on a large, four-manual organ, similar to the Schnitger organs in Hamburg that inspired his stylistically diverse compositions. Later Boehm became mentor to the young J.S. Bach in Luneburg. This product includes a free YouTube hosted video by the Davidsson Organ and Dance Collaborative. For details on this video and its role in the performance of this CD collection, see the article in the on-line PDF booklet.